I've recently decided to reduce my consumption of meats, which means I have more chances to enjoy the delicious flavors and textures of fruits, vegetables, and nuts. That also gives me more opportunities to play around with healthy organic produce and to come up with new concoctions. Here, I present a yummy recipe for meatballs that lacks, well, meat. I started the thought process by imagining what combination of ingredients might come close enough to meat. I chose red beets for both color and texture. I added squash to keep the dish flavorful and juicy, as in the my earlier Romanian meatballs recipe. I thought couscous would also go well into the composition (it adds consistency). Finally, I added ground walnuts for their rich flavor and for a bit of unexpected crunchiness. Throw in the onion, garlic, and spices, and the mixture smells so good and fresh that you want to eat it with a spoon before it's even cooked. I further find interesting the progression of color in the original meatball recipe and in this variation. 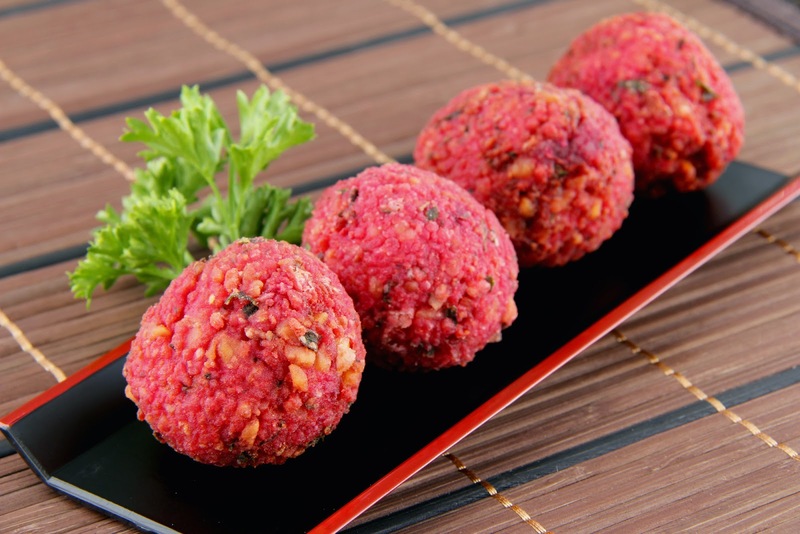 The meatball recipe starts with a pink colored mixture, a healthy tint brought about by the meat. However, the meatballs turn brown during the frying process. The color pigments in the red beets are much more persistent, which allows the meatless balls to maintain a beautiful pink tint all throughout. - Preheat the oven to 450F. Cover the red beets in aluminum foil, and bake for 90 minutes. Remove the beets from the oven and let cool. Then carefully peel, chop (I use a food processor), and set aside. - While the beets are cooking, place one cup of water in a pot, add two tablespoons of oil and a pinch of salt, and bring to a boil. Remove from heat, then quickly stir in a cup of couscous, cover, and let stand for five minutes. Use a fork to stir the cooked couscous until fluffy. - Clean, peel, and chop the squash, half of an onion, garlic cloves, walnuts, and parsley. Mix with the beets and couscous when ready. - Add the eggs and spices to taste. Mix everything until the composition is uniform. - Now to the cooking part. First, heat up the oil on medium heat. I use a deep pan, and I make sure the oil is about two inches deep (we want to have the balls completely covered in oil when cooking, such that their outer part cooks quickly and uniformly. - Use about two spoons of mixture to form each ball shape. Roll them through flour, then fry them for about two minutes each. - Even when cooked, the vegetarian meatballs will have a nice pink/red color due to the beets. Choose some fresh ingredients of colors that complement this: for example, fresh parsley or scallions. - I chose to present a few balls in a black long dish with a red outline: the black helps emphasize the nice colors in the meatballs, while the red delimits the presentation (while also matching the main color theme in the dish). An alternative presentation of this appetizer could have involved a bunch of meatballs in the center of a wider plate, surrounded by greens (scallions, cucumber slices, celery, or parsley), and accompanied by some cherry tomatoes and feta cheese cubes for extra color. Play with your imagination and your sense of style, and I am sure you can come up with even better presentations.